Vikings isn't the only star article → Find more of them! 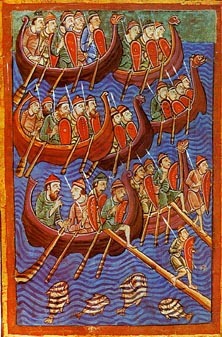 The Vikings were seafaring people of Norway, Sweden, and Denmark during the Middle Ages. They were known for their fierceness in battle as well as their terrifying raids on other peoples. In spite of their bad reputation, they traveled far and wide in their "long ships". They discovered Iceland, Greenland and North America. The ruins of a Viking settlement have been found at L'Anse-aux-Meadows, Newfoundland. Their power declined in the 15th century with the rise of the feudal system. The Viking Age began about 790 AD when the first raids were recorded. In 793, Vikings raided the monastery of Lindisfarne on a tidal island off the northeast coast of England. Vikings didn't hesitate to attack monasteries and churches because they weren't well protected places, monks could be easily attacked and lots of precious things, such as gold and silver objects could be found in monasteries and churches. "Never before has such terror appeared in Britain as we have now suffered from a pagan race. . . .The heathens poured out the blood of saints around the altar, and trampled on the bodies of saints in the temple of God, like dung in the streets." The Viking Age lasted through the Norman Conquest of England in 1066. The Viking Age is sometimes roughly dated 800 AD to 1100 AD. Countries most affected by Viking terrorism were Germany, France, England, Ireland, and Scotland. The Vikings traveled as far as Russia, Asia, North Africa, and colonized Iceland. The largest Viking town in Scandinavia was Hedeby. It has been estimated that Hedeby was home to 1,000 people at any one time. The site was occupied by Vikings for 250 years. There were twice as many men as women in Hedeby. An Arab geographer who visited Hedeby reported that life was hard in the town and residents were poor. They lived mostly on the plentiful fish in the area. Their main social activities occurred on feast days when the people gathered together to worship the gods. The Viking warriors were powerful and effective fighters. They didn't have better swords or better weapons than other people, but what made the difference was their great courage. The Viking warriors had no fear of death. They thought their destiny was actually to die in a heroic battle. At the beginning, Vikings were raiders: they went to some places to steal goods, kill everybody and go away without being caught. They were really powerful warriors with no fear of death. They used small and really fast boats to invade. Then the Vikings became invaders. They found that England was rich with plentiful of treasures and lands. The climate was warmer than in Scandinavia, they preferred it and decided to settle there in 865 AD. The Vikings also settled in various places of Europe and established a major city in the North of England: York (Yorvik). Cities like Kiev in Ukraine and Novgorod in Russia were also created by the Vikings. Vikings then became traders. They stopped raiding and started to exchange goods with other countries and to make a lot of money. They manufactured lots of products, such as jewelry, shoes and metal goods and became a rich society. Instead of using their boats for raiding, they built new vessels for trading with other countries. These boats were much slower but bigger. But there were still some Vikings who didn't want to live peacefully like that. They were called mercenaries. They attacked people for money. Sometimes, they even attacked other Viking communities. Some of these mercenaries are known to have gone to the Byzantine empire, to become kings or bodyguards. Evidence of their expeditions is provided by runic stones in Sweden. Vikings then became explorers. They travelled across Europe, thanks to their good navigation system. They discovered Iceland, Greenland and even North America. We know that the Vikings established settlements in North America, but archaeologists didn't find them yet. The Christian church and the Christian monarchs of Europe tried relentlessly to convert the Vikings to Christianity. The church and the monarchs of Europe forbade Christians to trade with heathens. Conversion to Christianity was sometimes a condition of peace treaties. Vikings preferred their ancient gods, but converted to Christianity when forced to do so by their leaders. Iceland accepted Christianity as a public religion in 1000, but Icelanders were allowed to sacrifice to the old gods in private. Famous Vikings include Leif Ericson and his father, Eric the Red. Some familiar English words have their roots in the language of the Norsemen. These words include skirt, shirt, axle, crook, raft, knife, plough, leather, bylaw, thorp, skerry, ombudsman, husband, heathen, Hell, Norman, ransack, and beserk. Viking literature includes world-famous long poems called sagas and eddas. The Vikings were never united under one leader. They travelled widely, but their power gradually declined. Many states in Europe adopted the feudal system. The Vikings were no match for the trained warriors of this system. 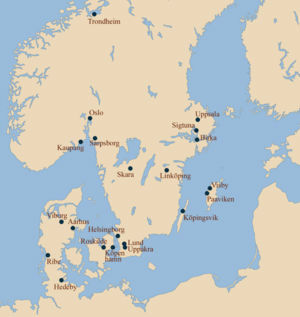 Many of the Viking settlements were destroyed or abandoned. The climate of Greenland grew colder. By 1410, the Greenland colony was abandoned. Although Viking power declined, the descendants of the Vikings lived on. Many of their ideas about honor, law, democracy, women's equality, and individual freedom have flourished long after the passing of the Viking Age. The Vikings were victims of their own success. They disappeared because they lost their culture and identity by merging with native populations and adopting Christianity. They lost their distinction and were finally no different from other people. ↑ 1.0 1.1 1.2 Clare, John D., 1992. The Vikings. Harcourt, Brace, Jovanovich. This page was last edited on 18 September 2018, at 21:58.